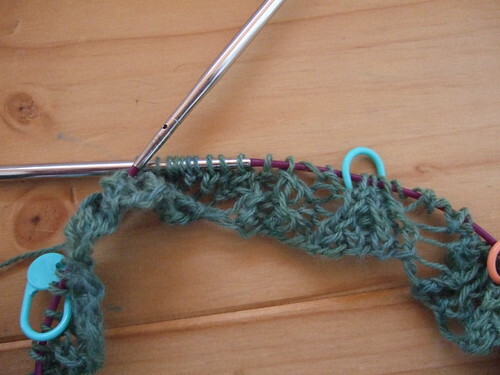 I haven’t knit lace for ages, and I had forgotten how much concentration it requires. I’ve already had to start again once because the yarn on the cast on row snapped when I was knitting the first row, and I couldn’t repair it. I’m using size 4mm needles, and they are really too large for the yarn (knitwitches heavy laceweight cashmere) so the effect is a bit too stringy for my liking – I think I will have to start again with a smaller needle. I got a lot of positive feedback on my round yoke cardigan. I’ve ordered some yarn to make another one. I decided on some Colourmart Cashmere in Olive in the end – unfortunately for me, the day after I ordered they added some better colours (I really like dark meadow and speckled wine), and I will write up a pattern when I make this one and post it on this blog.